We do not normally associate monks with style, but monk shoes are the exception to that rule. A well-designed pair of monk shoes can make the difference when you want to pull off a look that lies somewhere between formal and casual, with an added touch of style. What makes the monk shoe a specific style are the tell-tale straps. This design allows for the top of the shoe to have a simple buckle closing which some people prefer to having laces flapping around. The closed, smooth nature of the design give it a formal look, but with the fun and statement of the buckle. The monk strap shoe has been around for a long time in various forms. But like so many things in footwear, the exact origins of the monk shoe have never been definitively proven. The generally accepted knowledge within our industry suggests that the shoes date back to 15th century European monks whose days were spent labouring in fields. It is believed that these monks wore strapped sandals as their daily footwear. However, the sandals were really not appropriate for working in the fields or making long treks across rugged terrain. The monks therefore developed a closed toe version of their sandals that offered more protection. The story goes that an English gentleman doing business with a group of monks was so enamoured by their shoes that he took a pair home with him. From those closed-toed sandals was born the modern monk shoe. Whether or not the latter part of the story is true remains a matter for speculation. As for the modern version of the shoe, it really came into its own during the late 19th and early 20th centuries. It became a favourite among wearers looking for a casual shoe that was also both durable and stylish. It was at this time that designers began looking as much at the style of the shoe's two straps as their function. The defining feature of the monk shoe is the strap. Rather than being closed with laces, monk shoes sport at least one strap with a buckle. 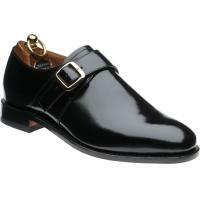 Many styles of monk shoes for men offer two straps across the top of the shoe (the 'double' monk shoe). Some female styles take the strap a bit higher on the vamp for higher fastening. Single Monk – The single monk has one broad strap that closes the shoe across the instep. It is typically kept closed by a saddle buckle made of metal. Some mens' designs feature wider tongues for more comfort. The single monk is a great choice for a subtle yet stylish look. Double Monk – As you might have guessed, double monk shoes feature two straps rather than one. Some see this merely as a fashion statement, but it is really not. The purpose of the second strap is to give a better fit. 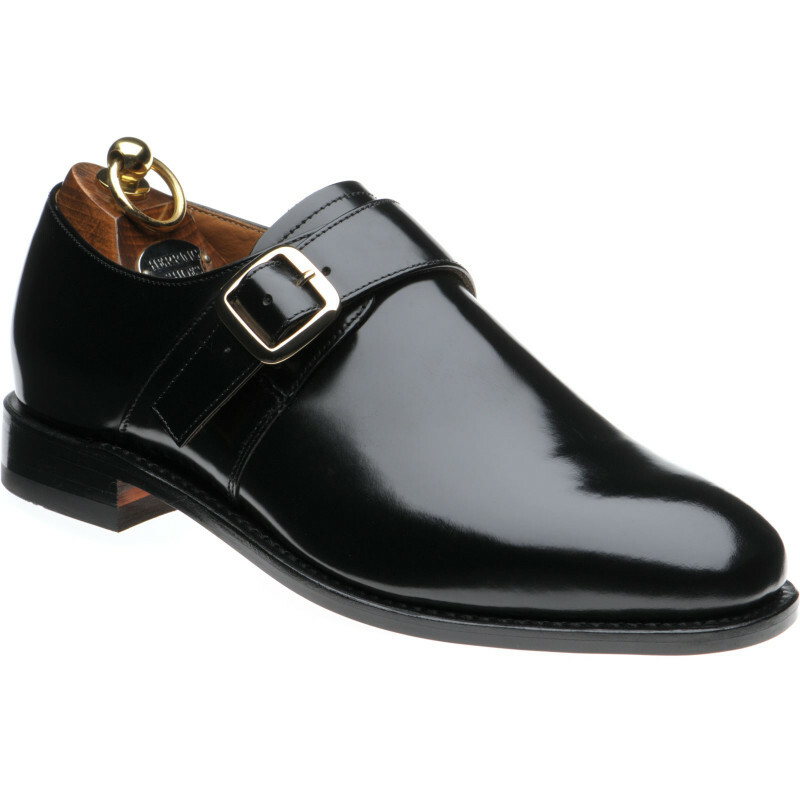 Double monks are better for narrower feet because the second strap holds them more securely in place. Cutaway Monks – The straps on traditional monks point downward toward the sole. Not so with a cutaway. The cutaway's straps tend to point back toward the heel. Cutaways can be either single- or double-strapped. Given that the monk shoe designation refers to straps as opposed to laces, there are other ways to distinguish one pair of monks from another. For example, you can have monk shoes with ornate hole-punched toe caps that also make the shoes brogues. However, in keeping with the general notion of simplicity, most monk shoes are usually fairly plain with few embellishments. Leather tends to be the material of choice for designers and manufacturers. It is sturdy, wears well, and provides a durable surface to which buckles can be attached. Having said that, leather is not the only material used to create monks. Suede monk shoes and suede double monks are variations that work well, offering a different texture and slightly more casual look than leather. Another important factor for monk shoes is the position of the strap(s). Your average single strap monk almost always places the strap near the top of the vamp. This provides maximum security of fit regardless of the size and shape of the foot. 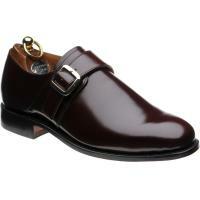 However, double monks can support straps in a variety of positions. The position and angle of the straps generally dictates the level of sophistication associated with a monk shoe. Less sophisticated styles feature straps that are closer together. Closely aligned angles that put the buckles in parallel are also common in the less sophisticated styles. The most elegant monk shoes show more space between straps and buckles. Furthermore, offset angles prevent the buckles from aligning in parallel. This gives a more textured look with a bit of visual noise intended to catch the eye. Monk shoes are relatively new as a fashion statement, if not formal footwear. As such, there are no hard and fast rules about how and when to wear them. Many sartorial experts consider the monk less formal than the Oxford but more formal than a Derby. The monk shoe is a versatile choice and can be worn in both business and casual settings. A well-designed monk works very well with a suit for general day-to-day wear, with black monk shoes perhaps considered a little more formal than other colours. With a slightly cleaner look, single monks provide a more formal look than double monks, while double monks bring a little more personality and are ideal for casual or party wear. Monk shoes would not usually be appropriate for black tie or very formal events requiring suits and evening gowns however, where an Oxford shoe would be preferred. Monk shoes are also a great choice for men’s casual wear. 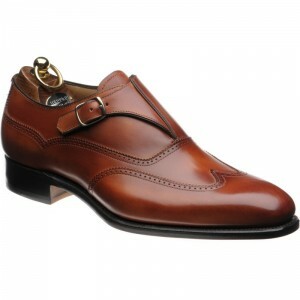 Brown monk shoes look superb worn with jeans, chinos or other casual trousers and are suitable for almost all social settings in which the wearer wants the entire foot covered. Black monks also work well for casual wear, particularly of an evening where the sleek lines and buckle lend a certain style of cool not offered by other types of footwear.